Michael Bates, retiring Managing Director of Human Kinetics Canada, the fitness publisher housed at 475 Devonshire Rd. Meanwhile, Alynn Anglin & Steve Hewitt have opened Anglin Financial Management at 1580 Wyandotte East, which previously housed the Meeting Place. Anglin and Hewitt have done a marvellous job renovating what was once a deli and lunch place. 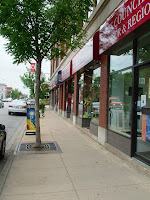 The old BMO bank at 1799 Wyandotte Street East, former home to T’Dye For Hair Salon (recently moved to 1464 Ottawa Street), has sold for $295,000. It will be leased for eight months while the new owners apply for a liquor licence with a long-term plan of opening a Martini bar. The landmark Peerless Ice Cream store, on the east side of Chilver at Wyandotte, has been sold and ice cream sales are now combined with an amazing tasting sushi. The old Deliotte and Touche building, 1666 Wyandotte St. E., has been bought by a group with plans to convert it into a church and community centre. The former Scratching the Surface building, 1514-20 Wyandotte East, yielded the best bargain. This property, listed under power of sale for $109,000, had seven offers the first day and was acquired for $140,000 by a numbered company. The 7,000 square-foot vacant lot on the north side of Wyandotte between Chilver and Windermere, is on sale for $319,000. This block housed four businesses before the buildings burned down during the blackout earlier this decade. Last, but not least, there is word that negotiations are in the final stages to locate a restaurant in the old Walkerville Pizza, 1737 Wyandotte E."
Fans of this neighbourhood (and fans of a healthy Windsor, period!) will welcome all this good news. Posted by Chris Holt at 8:29 p.m.
August 1, 2007 at 10:53 p.m.
Any chance you might like to join in the fray over the WUC thing? August 3, 2007 at 10:58 a.m. I've chosen not to address the whole WUC fiasco for the simple reason that there is no way I could do even remotely close to the great job being done by others. Paul Synott, Chris Schnurr, the "Mayor"'s FLUSH campaign...you catch my drift. I may just touch upon that in the future, though. Thanks Kirwood. August 3, 2007 at 11:32 a.m.